Paris Schutz joined us from the Loop with details. “They’re protesting some of these controversial swap deals – interest rate swap deals – that CPS has entered into with some of these banks, saying banks are making millions of dollars off of these while teachers are bearing the brunt of cuts,” Schutz said. The cuts would affect CPS support staff, like special education teachers and social workers. “They want to get rid of us, or possibly privatize us, so we won’t get the same benefits or the same pay,” said Toni Berglind, a special education support staff member. "We have to make a choice in this city: Banks or schools," CTU President Karen Lewis said at the rally. The cuts were announced earlier this week by CPS CEO Forrest Claypool after the Chicago Teachers Union rejected a contract offer from the district on Monday. That offer would have required teachers to pay more into their pensions, prohibited teacher layoffs due to budgetary reasons, included teacher raises and given teachers more autonomy in the classroom. Claypool and CTU President Karen Lewis said they’ll go back to the bargaining table to try and hammer out a new agreement, but the clock is ticking. CPS on Wednesday borrowed $725 million at an astonishingly high interest rate to help keep the district open through the rest of the fiscal year. Claypool and Mayor Rahm Emanuel have called on state lawmakers to give CPS more money through an overhaul of the state’s education funding formula that they say would be more equitable. On Thursday, powerful House Speaker Michael Madigan announced a special task force on education funding that will hold hearings beginning Feb. 16. Madigan’s move comes as Gov. Bruce Rauner has pushed a state takeover (and possible bankruptcy) of CPS, an action he cannot make without approval from the Democrat-controlled General Assembly that is currently at odds with Rauner over how to fund the state. Rauner has also said he is willing to work with Senate President John Cullerton on revamping education funding. Chicago Public Schools CEO Forrest Claypool on Wednesday spoke passionately about the need for education funding reform, calling the current system by which CPS is funded "separate but unequal." Gov. Bruce Rauner says he believes the General Assembly will pass his proposed legislation to have a state takeover of Chicago Public Schools and to enable them to declare bankruptcy. 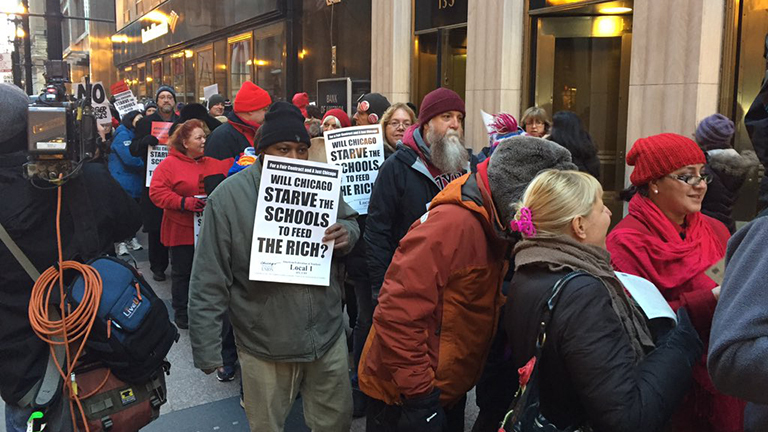 Feb. 2: The Chicago Teachers Union is fighting mad and pursuing legal action to strike immediately. CTU Vice President Jesse Sharkey talks about the latest developments. Feb. 2: Just a day after the Chicago Teachers Union rejected the school board's latest contract offer, Chicago Public Schools is announcing cuts. CEO Forrest Claypool says the district is still working to avoid teacher layoffs, but some staffers will lose their jobs in order for the district to save money. Feb. 1: Members of the Chicago Teachers Union bargaining unit say they spent hours and hours considering the school board's "serious" contract offer. But on Monday, the group announced that they could not accept it.